Updates to Anna Barbara (Anne)'s profile since your last visit are highlighted in yellow. How does one reduce 58 years to fit into one paragraph? Inasmuch as I’m not known for being succinct, I’ll try to give you just the highlights. After graduating with all of you from SE High in 1959, I went to what is now known as Central Missouri State University on an academic scholarship. However, after one year of required courses such as “Agriculture and Life”, I realized I was at the wrong school, headed in the wrong direction. I was fortunate to land a wonderful job in Kansas City that next year, during which time Jim Sheffield and I renewed the friendship we had at SE, when one beautiful Summer evening, we ran into one another at “Allen’s Drive-In”. (Remember Allen’s Drive-In?) We married that year and have celebrated 58 years of marriage. We have three children (who are hardly children any more): Michael S. Sheffield, 1962; Michelle (Mimi) Sheffield-Proctor, R.N., 1965; and Matthew C. Sheffield,J.D., 1968. Mike and Mimi graduated from K.U. – Mimi earning a Bachelor of Science in Nursing and Michael earning a MBA. Matt graduated from The George Washington University in Washington, D.C., with a B.A. in Political Communication, subsequently earning his law degree. He is Executive Director of Governmental Affairs for a major pharmaceutical corporation. He and his wife, Eden (also a KU graduate), and their two children, Benjamin (20) and Alexandra (16), live in Raleigh, NC. Mike and his wife, Susan (another KU graduate), live in Bucks Co., PA, along with their tson, Spenser (21), Junior in college. Micaela (24), graduated from K.U.) and Spenser (16). After 28 years in the pharmaceutical business, Michael is now an Executive with a a major pharmaceutical Corp. in the Oncology Division, in New Jersey. Mimi is an R.N. in surgery at Loudoun Hospital, here in northern Virginia, and also manages the rental of their condos in Myrtle Beach, SC. She and her husband, Teddy, have reared Tedddy's son, Blake live not far from us, which is a blessing. During our marriage, we have lived in Kansas City, MO, Salt Lake City, UT, Leawood, KS, Princeton, NJ, and now in "Heritage Hunt", in Gainesville, VA, a northern Virginia suburb of Washington, D.C. While rearing three children, I continued my education taking night school classes, earning my Paralegal Certification, and real estate licenses in MO, KS, NJ, and PA. Along the way, I have worn many hats from Cub Scout Den Mother and Brownie Leader to Public Relations Liaison for the Superintendent of KCMO Schools; Kansas Regional Director for the American Lung Association; Senior Administrator of the School of Engineering for The George Washington University, just to name a few. I worked for GW for 18 years during which time our youngest son was at GWU. I retired when I was 65. For several years after retiring, I taught school for Loudoun County schools, here in northern Virginia, as a substitute teacher, which I loved. 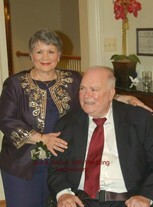 Now, I am a full-time caregiver to Jim, as his condition continues to deteriorate. My favorite career, however, and the one of which I am most proud, has been as the mother of three wonderful children ~ and grandmother to their five children. During 1986 and 2003, all three of our children married and our four grandchildren were born. In 1995, at the age of 54, Jim was felled by a serious stroke-like illness which caused severe brain damage,rendering him unable to walk, talk, feed himself, and caused irreversible brain damage. It’s been a long journey, and, although he is wheelchair-bound, he can now talk, feed himself, and loves to receive e-mail, however, in 2015, it was necessary to move Jim into a nursing home because he was having disastrously dangerous falls, requiring more help than I could give him. During these years, we have both lost our parents and Jim’s sister, JoAnn. My sister, Linda, still lives in the KC area. My younger sister, Charlene, and her family live here in northern Virginia. During the years, I have had the fun of traveling with Jim on some of his international junkets to Norway, Sweden, Denmark and spent several weeks in Germany when Jim was honored by his employer (a German manufacturing company). When my sister, Charlene, and her husband lived in Budapest, Hungary, for four years, she and I had fun touring Hungary, Austria, Switzerland, and Germany. The year before I retired from GW, I accompanied six doctoral students and their professor for three weeks, traveling all over Egypt as the students conducted research. Jim and I will celebrate fifty-eight years of marriage three, at which time our children gave a beautiful 50th wedding anniversary party (see picture) for us here at the Clubhouse in Heritage Hunt, an active adult (and fast becoming a retirement) community in Gainesville, VA, where we moved four years ago so that we could be on one floor in order that Jim could get around in his wheelchair more easily. I still enjoy writing and have had several articles published. I have written two books and six children’s books, all of which one day I hope to find the time to find a publisher. In the meantime, we are very thankful that we are able to just take life one day at a time. Anna Barbara (Anne) Wilson Sheffield has a birthday today. New comment added. 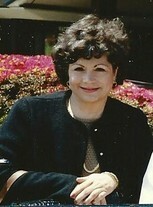 Anna Barbara (Anne) Wilson Sheffield updated her profile. View. Anna Barbara (Anne) Wilson Sheffield has a birthday today. Anna Barbara (Anne) Wilson Sheffield added a comment on her Profile. Anna Barbara (Anne) Wilson Sheffield posted a message. New comment added. Thank you, Judi and Linda, for watching out for these things as all of us "out-of-towners" would otherwise have missed it. Yes, I knew Carol very well and briefly dated her brothet, Vern. Carol could dance and do the "West Coast Swing" better than anyone I knew! Her rendition to "Night Train" would put me in awe of her! She was a lot of fun and I know her loved ones will miss her immensely! My deepest sympathy to her family. Congratulations, Helen! You've reached a "milestone"! Milestones are usually considered to be only certain ages (ex., 21, 30, 40, 50, 65, 70, etc. ), however, I think attaining age 75 is monumental - and to my point, I plan to join you in two weeks! Ha! HAPPY BIRTHDAY! A very HAPPY BIRTHDAY, pretty lady! Your birthday falls a day after Jim's and Tom Warners'. They are both on January 21 (1941). You've got to be much younger because you couldn't possibly be 75! If so, you certainly don't look it! Isn't that (compliment) about the BEST birthday present we can receive at this time in our lives? (I'll expect it back on March 13th! Ha!) Hope your day is wonderful, just like you! 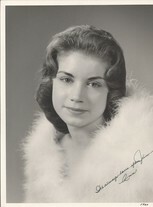 Anna Barbara (Anne) Wilson Sheffield has left an In Memory comment for Marilyn Breckenridge Smith. Finally, after fourteen years, I was able to get back toK.C. I visited my sister, Linda, who hasn't been doing too well after two strokes. While there, I had the fun of being able to see two old friends, Joanne (Betts) Kelley and Linda (Thompson) Ackerman. What a looong, wonderful and fun renewal of our friendships. Regretably, I didn't get a picture with Linda, but Joanne's husband snapped a picture of the two of us. What a fun Sunday afternoon, catching up with very dear, old friends. I miss them both already! Anna Barbara (Anne) Wilson Sheffield posted a message. A very HAPPY BIRTHDAY, Jim! Birthdays are becoming more and more precious, aren't they?! Hope yours is extra special! Anna Barbara (Anne) Wilson Sheffield added a photo to her profile gallery.